We love, love, love Karma Wilson books in our house. Bear is a little nervous about losing his first tooth, but his friends are beside him every step of the way. 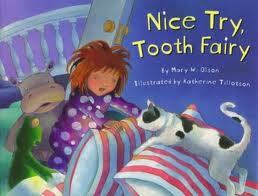 The tooth fairy even comes to visit and leaves Bear a tasty treat for the next morning. 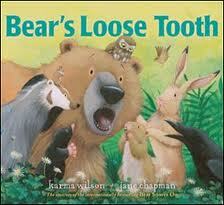 This book is just as cute as all of Wilson’s other adorable Bear books and your kids will love it. This would be an especially great book for the child in your life who hasn’t lost any teeth yet, but is at about that age or any child who has lost a tooth or two, but still has several more to go. A little girl has a loose tooth and she is hoping falls out soon because she needs the money from the tooth fairy so she can buy her dad a birthday present. I love that is rhymes and that it mixes English and Spanish together is a way that you can figure out what the Spanish words mean even if you don’t know Spanish. 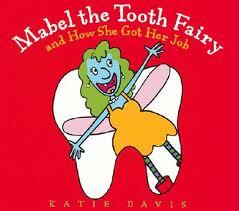 Mabel the Tooth Fairy used to be just a plain old regular fairy (who also didn’t brush or floss her teeth). All of her teeth fell out so she hatches a plan to get some teeth…she starts collecting the teeth that children have lost. 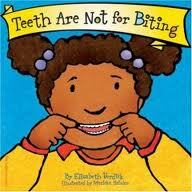 This plan doesn’t work for her though because all of the teeth are the wrong shape and size. So she decides to take a vacation where she meets up with a dentist who is also on vacation. They work together and come up with a plan to solve Mabel’s problem. 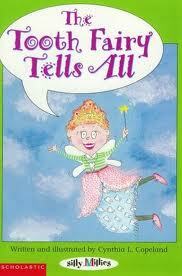 The Tooth Fairy, and her sidekick Wisdom Tooth, explain everything from shark teeth to baby teeth. 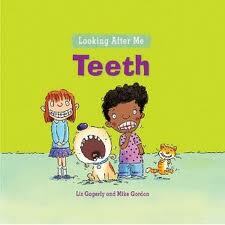 They also explain why we big people need big teeth and why it’s important to brush. A little girl learns more about how to take care of her own teeth after she discovers that her dog has a rotten tooth that needs to be taken out because she had been feeding him doggy treats and cookies. This is such a fun book! 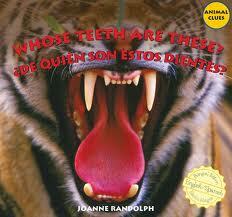 Children use picture clues and riddles to guess whose teeth are in the picture. This book is written in both English and Spanish. A fun and whimsical Seuss-styled romp about teeth, all the places you might find them, losing them and some basics on how to take care of them. This is a fabulous story about how a dad and his son come to terms with growing up and starting to hear from friends and older kids that maybe some of the things you’ve always believed in may not be true. 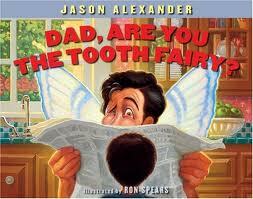 The advice from father to son in this book could be applied to Santa, the Easter Bunny or the Tooth Fairy. The bottom line is…”it’s a balance between their heads and their hearts. One without the other is an empty life.” This book is so touching and very thought provoking. Emma’s lost tooth was picked up by the tooth fairy, but now Emma wants it back because her grandpa is visiting and she wants to show it to him. The tooth fairy, however, can’t seem to find the exact tooth that Emma lost and night after night brings her the wrong tooth…a hippo’s tooth, a porcupine’s tooth, a skunk’s tooth, an alligator tooth and an elephant’s tusk. 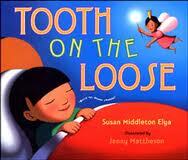 Finally, the tooth fairy finds the right one and shortly thereafter Emma loses another tooth.